Scotland has some of the best scrambling in the UK from the classic Aonach Eagach in Glencoe to an ascent of Stac Pollaidh in the Northern Highlands. If you are a walker who wants to have an introduction to scrambling and how to use a rope safely in the mountains then we can provide a 1 or 2 day introduction course. This can be based in Fort William, Ullapool or on the Isle of Skye. To find out what we've been up to at Alpha Mountaineering recently then go to our News and Conditions page. Check out what past clients have to say about Alpha Mountaineering on our Client Testimonials page. If you already have some experience scrambling but want to progress to doing harder scrambles then we can provide the safety and teaching that you'll need. Base yourself in Fort William, Ullapool or on the Isle of Skye and spend 2, 3, 4 or 5 days getting to grips with some of Scotlands classic scrambling routes. 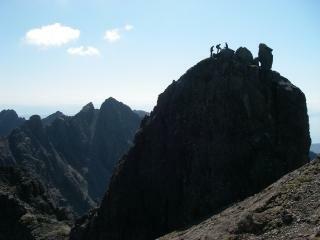 For those that want a real challenge then we can attempt the Skye Ridge Traverse. 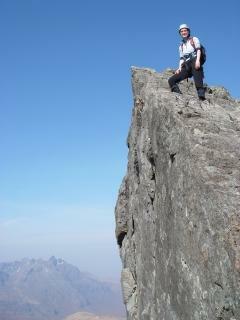 This is a very challenging mountaineering outing requiring good fitness and scrambling skills. The best time to book a scrambling course is in April, May, June, September or October. The best time for the Skye Ridge is May or June. Contact us to chat about what you are interested in achieving.